Circle-to-land approaches get a bad rap. Granted, they earned it by breaking a bunch of aircraft, and they can lure the unprepared out of bounds in an eye-blink. Yet to say, “I’d never …” can be just as dangerous as going cavalier, because circling approaches aren’t one-size-fits-all. Best case, a circling approach is essentially ending your instrument approach by flying a traffic pattern to the runway of your choice. We don’t think about breaking out into VFR and joining the downwind as circling, but it is. Few people would call that an inherently a risky maneuver. Now it’s true that you must enter that pattern without the benefit of seeing the airport approaching from miles away, but hopefully, you made the approach with the intent to circle so your transition from approach to traffic pattern isn’t an improvisational move. That’s critical both for situational awareness and because the approach plate or AF/D may restrict which patterns are available for which runways. Click it up to nighttime yet keep the ceilings and vis at VFR, and it’s still just a traffic pattern starting from an unusual position. Your goal is to get from the point of breakout into a position where the rest of the turns are just a traffic pattern, albeit at night. The point is that you maximize your safety by planning the transition from the safety of the approach to the safety of a normal pattern. Don’t let 1100 OVC on the METAR lull you into ignoring that plan—and don’t drop any further on your altitude just because MDA is only 400 AGL. Use just enough descent to get you the visibility you need to maneuver and land. When ceilings drop below pattern altitude and vis is restricted, the goal is still to rejoin an otherwise normal pattern already in progress. When ceilings are 500 feet AGL or less, the only visual part of a normal pattern is final. A common (and too often fatal) circling error is flying a simultaneous close-in turn plus a descent to join a really short final. The better move is to fly far enough away from the runway to make a level turn at or above the circling MDA so you can line up with the runway first—while still at or above circling minimums—and then descend for landing as you intercept a normal short final. That’s not as simple as it sounds. However, GA aircraft have it over transport jets when it comes to circling. Bear with me as we haul out some math. If you fly far enough away from the airport to intercept a three-degree approach to landing 500 feet higher than the airport, you’ll be 1.6 miles from touchdown. Add 0.6 miles for a turn radius at 15-degree bank and 100 knots true and we pass a point 2.1 miles from the airport. That’s more than half a mile beyond the protected area of standard Cat B circling. Yikes. It would be even worse going faster or banking less. However, if our goal is maneuvering for a standard GA pattern, that’s comfortably a decent angle of 4.5 or 5 degrees. You’ll descend into VASI or PAPI red-over-white indications, but that’s a common procedure with light GA aircraft. That puts you about 0.8 miles from a touchdown point once you line up on final. Add the circling radius again and call it 1.5 miles at your furthest point from the airport. That’s right at standard Cat B limits of 1.5 and barely inside new Cat B of 1.7 for sea level (See sidebar). Cat C mins give you 1.7 miles under the old standard and at least 2.7 under the new. However, we’re still not done, because you probably can’t go that far. It comes down to how wide your turn radius is and inside how big a protected area. Here’s an example for a protected area of 1.5 miles (Cat B) and a turn radius of 0.6 nm (100 knots true and about 15-degrees bank). In this case, the furthest you could fly “downwind” past the abeam position and still turn inside the protected area is 0.67 miles. Speaking of wind, presumably, you’re circling to land into the wind, so at least part of your maneuver will be with a tailwind. If that tailwind is on a downwind to your landing runway, ensure you start your turn back to final early enough that you don’t exceed the circling distance while you have the extra groundspeed. The turn back to the airport will slow everything down to your advantage and steepen your effective descent angle. If you’re working a crosswind, try to turn such that you’ll head into the wind as you head for final. You’ll have to watch out while you have a tailwind as always, but the latter part of the turn is into the wind and slows your closure on final with the nose already in the direction of the crab down final. Lowering your airspeed and steepening your bank angle tightens your turn radius, but also puts you closer to an accelerated stall. Anything to reduce that possibility is a plus. The takeaway from all of this is that you can improve your circling safety by using a circling minimum that gives you enough room for that turn and line up before descending — for the situation and specific approach. That takes some planning and might be higher than your book approach category. Then use that distance to make the turn separately from the descent, or at least the last 500 feet of the descent if the circling mins are really high and you know you’ve entered an obstacle-free wedge lining up on final. Most circling accidents happen in the maneuver to line up on final when the pilot gets disoriented or gets too low before having a clear path to the runway. 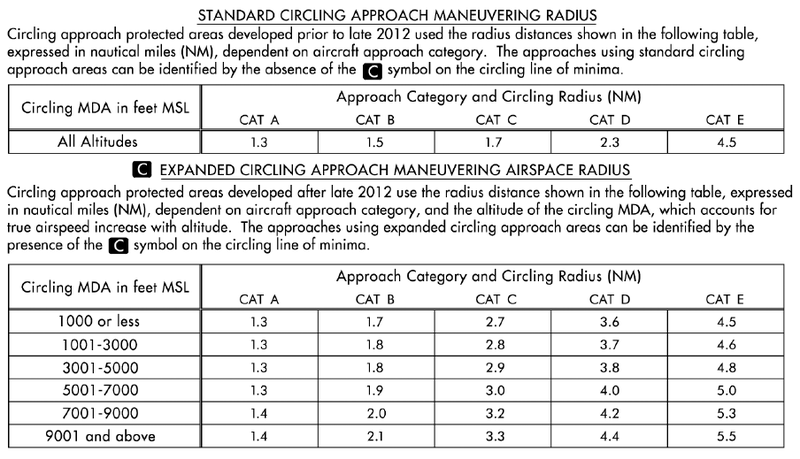 Traditional circling minimums don’t take into account increases in true airspeed, and therefore turning radius, with increasing altitude. I assume the thinking was that pilots would realize that at 5000 feet their 90 knots indicated would have turn radius befitting 99 knots and they should fly to a higher category. The traditional circling distances are pretty tight as well, sometimes for no reason. There’s no way to know if adding an extra mile would have no effect on circling MDA. To deal with this, the FAA instituted new circling minimums. The AIM says approaches created or amended after 2012 have the new minimums, but that’s not true. They really started using them in June 2013, and not in every case. The thing to look for is the inverse C in the circling minima line of the approach chart. If you see it, the new, kinder, wider, altitude-adjusted circling minimums apply. If not, it’s the old standard even on newer approaches.